IFN-αβ is a potent immunoregulatory cytokine involved in the defense against viral and bacterial infections. In this study, we describe an as yet undefined IFN-αβ-dependent pathway of IFN-γ induction in mice. This pathway is based on a synergism of IFN-αβ and IL-18, and is independent of IL-12 signaling yet dependent on STAT4. In contradiction to current dogma, we show further that IFN-αβ alone induces tyrosine phosphorylation of STAT4 in murine splenocytes of different mouse strains. This pathway participates in the induction of IFN-γ by Gram-negative bacteria and is therefore expected to play a role whenever IFN-α or IFN-β and IL-18 are produced concomitantly during bacterial, viral, or other infections. Interferon-γ is an important factor of the innate and adaptive immune defense against infection. Defects of IFN-γ or IFN-γ receptor lead to an enhanced susceptibility toward intracellular pathogens, including mycobacteria and Salmonella in mice and humans (1). The induction of IFN-γ involves complex pathways. IL-12 and IL-18 are two cytokines intimately involved in the induction of IFN-γ by bacteria and other microbial agents. Both cytokines were shown to possess IFN-γ inducing activity and/or to synergize with each other in the induction of IFN-γ (2, 3, 4, 5). IFN-αβ is another cytokine involved in the induction of IFN-γ (6). IFN-αβ is strongly induced by viruses and dsRNA. In mice, IFN-β (but not IFN-α) is also induced by Gram-negative bacteria and LPS isolated from their cell wall (7, 8). The induction of IFN-β by Gram-negative bacteria, which is due solely to the LPS component (8), proceeds only in Toll-like receptor 4 (tlr4)4 normal LPS responder mice, while the induction of IL-12 and IL-18 proceeds also in tlr4-deficient LPS nonresponder mice (8) (M. A. Freudenberg, C. Kalis, and C. Galanos, unpublished data). Consequently, the IL-12 (IL-18) pathway of IFN-γ induction is present in LPS nonresponder mice while that involving IFN-β is absent. The tlr4-deficient C57BL/10ScCr (Cr) mice (9, 10) exhibit additionally a defect of IL-12 unresponsiveness (11) resulting from a point mutation of the IL-12rb2 gene (12). Consequently, neither the IL-12 (IL-18) pathway of IFN-γ induction nor that involving IFN-β is functional in these mice. A role for IFN-αβ in the induction of IFN-γ was first reported in an earlier investigation in which the IFN-γ response of mouse splenocytes to Gram-negative bacteria was inhibited by anti-IFN-β (13). In the same study, splenocytes of Cr mice were found to produce IFN-γ in response to bacteria, but only if together with the bacteria IFN-β or IFN-α was added to the cultures. 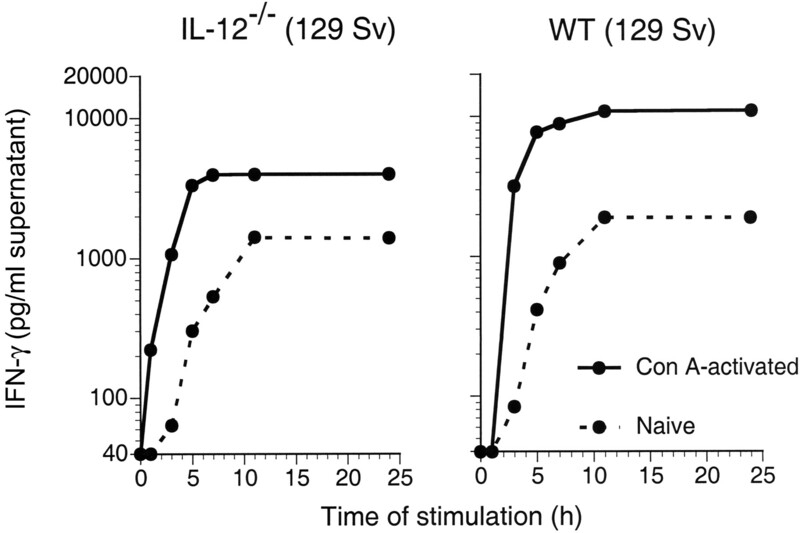 This IFN-β-dependent induction of IFN-γ by Gram-negative bacteria was IL-12-independent, as shown retrospectively in a later study in which Cr mice were shown to exhibit an IL-12 unresponsiveness (11). IFN-αβ has been reported to induce IFN-γ in activated T cells (14), macrophages (15), and activated NK cells (16). Furthermore, the CD8 T cell IFN-γ response of virus-infected mice was dependent on endogenous IFN-αβ and independent of IL-12 (17). Similarly, an IFN-αβ-dependent and IL-12-independent IFN-γ induction was found in Chlamydia-infected murine macrophages (18). The precise function of IFN-αβ in the induction of IFN-γ is hitherto unknown. It has been shown that human IFN-αβ alone, and more efficiently in combination with IL-18, induces IFN-γ in human T cell blasts (19) and NK cells (20). The induction of IFN-γ by IFN-αβ in activated mouse NK cells could be enhanced by TNF-α (16). Human IFN-α was shown to phosphorylate the factor STAT4 in activated human T cells and NK cells (21). Although IFN-αβ activates human STAT4, it failed to do so in mouse Th cells, thus suggesting that the STAT4 pathway from IFN-αβ to IFN-γ expression is operational in the human but not in the mouse (22). In the human model, STAT4 was shown to be activated upon recruitment to the IFN-αβ receptor complex specifically via the C terminus of STAT2 (23). The inability of IFN-αβ to activate mouse STAT4 was explained by the identification of a minisatellite insertion into the mouse Stat2 gene, which selectively disrupted the capacity of murine STAT2 to activate STAT4, but not other STATs (24). From these results, the mechanism linking innate and adaptive immunity appeared absent in mice and the validity of using mouse models for the study of human disease was questioned. In this study, we present evidence for the existence of an IL-12-independent pathway of IFN-γ induction by Gram-negative bacteria in mice, in which IFN-β and IL-18 act in synergy to induce STAT4-dependent IFN-γ production in naive and activated murine splenocytes. We show further that in this overall synergistic effect, IFN-β alone is responsible for tyrosine phosphorylation of STAT4. 129 SvPas, BALB/c, C57BL/6, Cr, IL-12p35/p40 (IL-12−/−), IL-12Rβ1−/−, and STAT4−/− mice were bred at the Max-Planck-Institut (Freiburg, Germany). Breeding IL-12−/− and IL-12Rβ1−/− pairs were provided by Dr. M. K. Gately (Hoffmann-La Roche, Nutley, NJ), STAT4−/− pairs were purchased from The Jackson Laboratory (Bar Harbor, ME). Salmonella typhimurium, S. abortus equi, Escherichia coli O8, Pseudomonas aeruginosa, Proteus mirabilis, and Klebsiella pneumoniae were grown and killed as described (8). Murine recombinant (mr) IFN-β was a gift from Dr. N. Moryama (Toray Industries, Tokyo, Japan) and mrIFN-γ was a gift from Dr. A. R. Adolph (Bender MedSystems, Vienna, Austria). mrIFN-α was purchased from Life Technologies (Karlsruhe, Germany), mrIL-12 was obtained from BD PharMingen (San Diego, CA), and mrIL-18 was obtained from PANSYSTEMS (Aidenbach, Germany). Human recombinant (hr) IL-18 binding protein (IL-18BP) was produced as described (25). This protein neutralizes the biological activity of human and murine IL-18 (26). Roferon A was from Hoffmann-LaRoche (Grenrach-Wyhlein, Germany). The following mAb were used: anti-mIFN-β (rat IgG1; Yamasa Shoyu, Tokyo, Japan), anti-mIFN-α (rat IgG1; Life Technologies, Gaithersburg, MD), anti-STAT4 (C-20; Santa Cruz Biotechnology, Santa Cruz, CA), anti-phosphotyrosine (4G-10; Upstate Biotechnology, Lake Placid, NY), and HRP-conjugated rabbit anti-mouse Ab (DAKO, Glostrup, Denmark). Con A was purchased from Pharmacia (Freiburg, Germany). Naive and Con A-activated splenocytes (pooled cells of three to six mice) were prepared as described (11, 12). Naive or activated cells (2 × 106/0.2 ml serum-free DMEM) were cultured in 96-well plates (Nunc, Roskilde, Denmark) in the presence or absence of stimulating agents or inhibitors (10 μl/well) for 24 h, unless otherwise stated. IFN-γ was estimated by ELISA (27). The IFN-γ results appearing in Figs. 1–4⇓⇓⇓⇓ are means of duplicate values. SDs were in all cases below 5%. Induction of tyrosine-phosphorylated STAT4 in Con A-activated cells, immunoprecipitation of STAT4, and Western blot analysis were conducted as described (11). 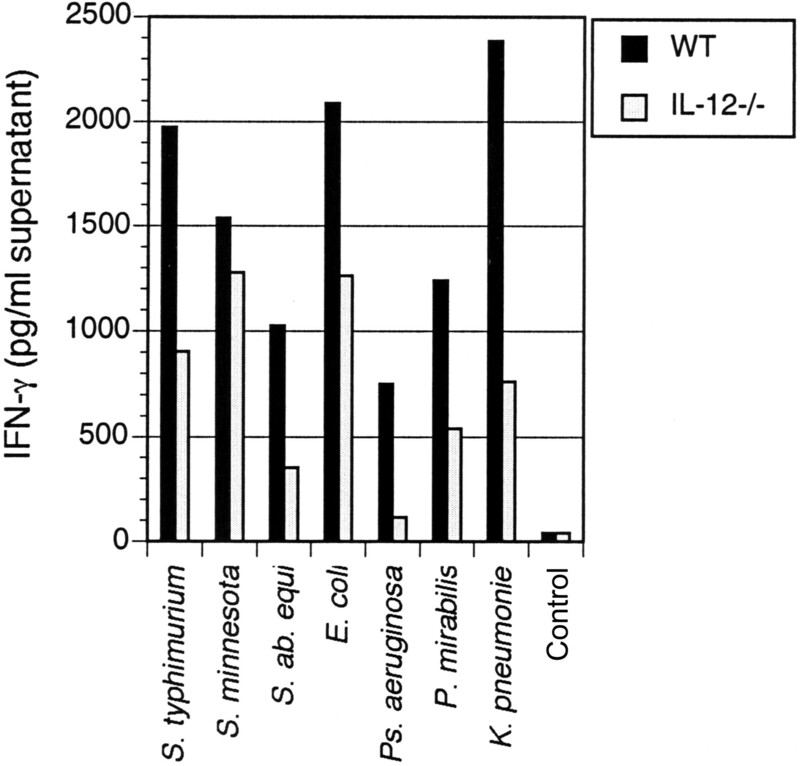 IFN-γ responses to different Gram-negative bacteria of splenocytes from WT and IL-12−/− 129 Sv mice. Splenocytes (2 × 106) were stimulated with different heat-killed Gram-negative bacteria (20 μg). Unstimulated splenocytes produced no detectable IFN-γ. One representative experiment of three is shown. Evidence for an IFN-β-IL-18-dependent pathway of IFN-γ induction by S. typhimurium that requires STAT4 but not IL-12. Splenocytes (2 × 106) from WT (129 Sv and BALB/c), IL-12−/− (129 Sv), and STAT4−/− (BALB/c) mice were stimulated with heat-killed S. typhimurium (Stm; 20 μg) alone, or in combination with IFN-β (104 U), in the presence or absence of anti-IFN-β (5 μg), or IL-18BP (200 ng). Splenocytes cultured in the absence of stimuli, or in the presence of IFN-β, anti-IFN-β, or IL-18BP alone produced no detectable IFN-γ. One representative experiment of four is shown. mrIL-18 synergizes with mrIFN-αβ, but not hrIFN-α, in the IL-12-independent induction of murine IFN-γ that requires STAT4. a, The synergistic effect of IFN-β and IL-18 is dose-dependent and proceeds in the absence of IL-12. Splenocytes (2 × 106) from IL-12−/− 129 Sv mice were cultured in the presence of indicated amounts of IFN-β and IL-18. b, IL-18 synergizes with murine IFN-αβ, but not human IFN-α, for the induction of IFN-γ via the STAT4-dependent pathway. Splenocytes (2 × 106) from WT 129 Sv and BALB/c, IL-12−/− 129 Sv and STAT4−/− BALB/c mice were stimulated with a combination of either murine IFN-β or IFN-α (104 U), or human IFN-α (Roferon A; up to 3 × 104 U), and mIL-18 (20 ng). Splenocytes cultured in the presence of either type I IFN or IL-18BP alone, or in the absence of stimuli produced no detectable IFN-γ. One representative experiment of three is shown. Time course of IFN-γ induction by IFN-β and IL-18 in naive and Con A-activated splenocytes of IL-12−/− and WT mice. Freshly prepared or Con A-activated splenocytes were stimulated for the times indicated with a combination of mIFN-β (104 U) and mIL-18 (20 ng). One representative experiment of three is shown. Because IFN-γ induced by Gram-negative bacteria results from activation of IL-12- and IFN-β-dependent pathways, segregation of the two should facilitate the identification of the major factors, involved in the latter pathway. We examined total and IL-12-independent IFN-γ responses using splenocytes of wild-type (wt) and IL-12−/− mice, respectively. Both types of cells exhibited IFN-γ responses of varying degree to the different bacteria used (Fig. 1⇑). The responses of splenocytes of IL-12−/− mice were ∼20 to 80% of those of wt mice. Addition of anti-IFN-β inhibited the IFN-γ response of wt and IL-12−/− cells to S. typhimurium by ∼30 and 50%, respectively (Fig. 2⇑), while addition of anti-IFN-α was without effect (not shown). Similar inhibition by anti-IFN-β was observed also in response to other Gram-negative bacteria (not shown), indicating that a substantial part of this response is IFN-β-dependent but independent of IL-12 signaling. Addition of mrIFN-β to the splenocyte cultures enhanced the IFN-γ responses to S. typhimurium, an effect blocked by the inclusion of anti-IFN-β (Fig. 2⇑). mrIFN-α could substitute for mrIFN-β in the enhancement of IFN-γ response (not shown). IFN-γ induction by IFN-αβ in splenocytes occurred only in the presence of bacteria; neither IFN-β (Ref. 13 ; Fig. 3⇑a) nor IFN-α (13) alone induced IFN-γ, indicating that an additional factor(s) induced by the bacteria must participate in this induction. One obvious candidate was IL-18. Therefore, we examined the effect of IL-18BP (4), an inhibitor of IL-18 activity, on the IFN-γ response to S. typhimurium. 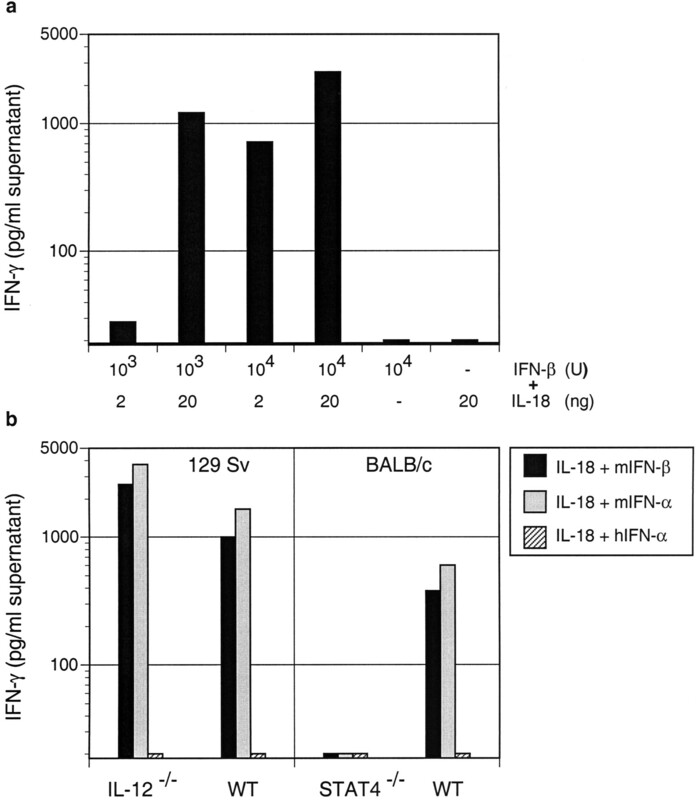 rIL-18BP inhibited the IFN-γ response to S. typhimurium by 85 and 50% in wt and IL-12−/− splenocytes, respectively (Fig. 2⇑). IL-18BP also showed strong inhibition (70 and 80%) in splenocytes treated additionally with IFN-β. The possible requirement of STAT4 in the IFN-β-dependent IFN-γ induction was examined using splenocytes of STAT4−/− mice. Stimulation of these cells with S. typhimurium alone, or in combination with IFN-β (Fig. 2⇑) or IFN-α (not shown), induced no IFN-γ. From the above results we concluded that in mice, the IFN-γ induced by Gram-negative bacteria via the IFN-β pathway required participation of endogenous IL-18 and was STAT4-dependent. Because bacteria induce a spectrum of cytokines in splenocytes, we used mrIFN-αβ and mrIL-18 to investigate whether these two cytokines suffice to induce IFN-γ in the absence of bacteria. Splenocytes of IL-12−/− mice were stimulated with IFN-β or IL-18, or both. Although neither of the two cytokines alone induced IFN-γ, the combination elicited IFN-γ production in a dose-dependent manner (Fig. 3⇑a). Comparable results were obtained using splenocytes of wt mice and where IFN-β was replaced by IFN-α (Fig. 3⇑b). The combination of IFN-α or IFN-β with IL-18 induced IFN-γ also in splenocytes of mice of other strains with an impaired IL-12 function (IL-12−/− C57BL/6, IL-12Rβ1−/−, and Cr), and in the respective wt (not shown). However, IFN-αβ and IL-18 failed to induce IFN-γ in splenocytes of STAT4−/− mice (Fig. 3⇑b). In the above experiments, human IFN-α (Roferon A) could not replace murine IFN-αβ (Fig. 3⇑b). In the study so far, the induction of IFN-γ was studied in primary cultures of naive splenocytes. In earlier studies (14, 19, 21, 22, 28), cells or cell lines were usually pretreated with different additives (such as T cell mitogens, IL-12, IL-2, and/or anti-IL-4 Abs) which are known to precondition the cells to elicit a greater response. For this reason, we compared the induction of IFN-γ by type I IFN and IL-18 in naive and Con A-activated splenocytes from IL-12−/−, STAT4−/−, and wt mice. Activation of IL-12−/− and wt splenocytes with Con A enhanced both the kinetics and the height of IFN-γ response (Fig. 4⇑), the latter being particularly high in the case of wt. However, despite activation, STAT4−/− splenocytes remained unresponsive to IFN-β and IL-18 (not shown). Having shown that the induction of IFN-γ by IFN-αβ and IL-18 requires STAT4, we next determined which of the two cytokines was responsible for STAT4 activation. Con A-activated splenocytes of wt and IL-12−/− mice were stimulated for 15 min with murine IFN-β, IL-18, IL-12, or human IFN-α individually or with a combination of murine IFN-β and IL-18. Phosphorylated STAT4 was present in cells stimulated with IL-12 (Fig. 5⇓a) or IFN-β, alone (Fig. 5⇓, a and b) or in combination with IL-18 (not shown), and absent from cells stimulated with IL-18 (Fig. 5⇓, a and b) or human IFN-α (Fig. 5⇓a), and from unstimulated control cells (Fig. 5⇓, a and b). For the induction of tyrosine-phosphorylated STAT4, IFN-β could be replaced by murine IFN-α (not shown). Thus, murine IFN-αβ, but not human IFN-α, is capable of inducing activation of STAT4 in mouse cells. 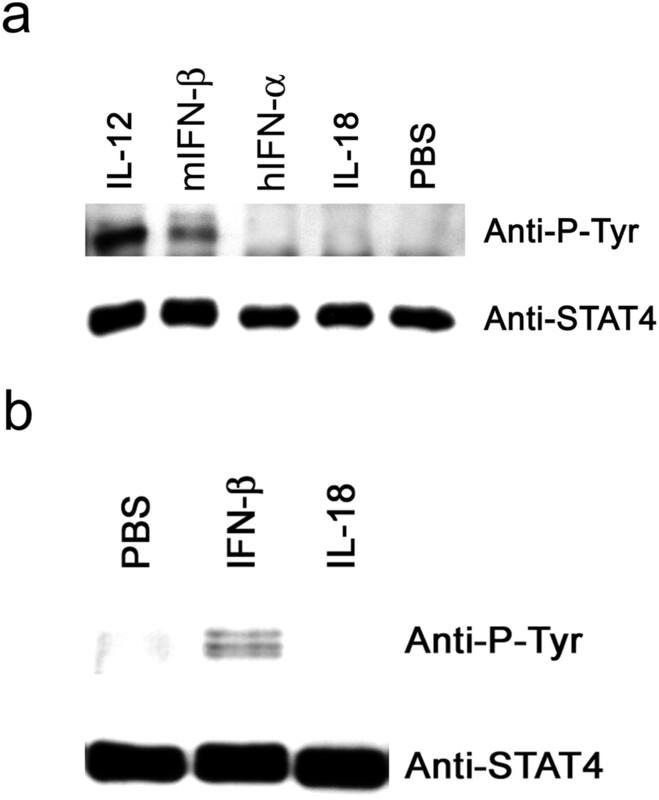 IFN-β induced tyrosine phosphorylation of STAT4 in WT (a) and IL-12−/− (b) 129 Sv splenocytes. Con A-activated splenocytes (5 × 107) were stimulated at 37°C with IL-12 (50 ng), mrIFN-β (1.25 × 105U), hrIFN-α (1.25 × 105U), or IL-18 (50 ng) for 15 min. Cell lysates were immunoprecipitated with anti-STAT4 followed by immunoblotting with anti-phosphotyrosine. To control for equal loading, the blots were stripped and reprobed with anti-STAT4. One representative experiment of three (a) or two (b) is shown. Of the two pathways of microbial IFN-γ induction hitherto known, the one dependent on IFN-αβ is only superficially understood, and scattered bits of information suggest that humans and mice do not share the same pathway. The present results allow the murine pathway of IFN-γ induction to be clearly defined. We show that Gram-negative bacteria can stimulate IFN-γ induction by a pathway that is independent of IL-12 signaling. This stimulation is based on a synergism between IFN-β and IL-18 and requires activation of STAT4. IFN-α could substitute for IFN-β in the IFN-γ induction, which is in accord with the fact that the two cytokines activate cells via a common heterodimeric receptor (29). The induction of IFN-γ by IFN-αβ and IL-18 is expected to occur whenever the two cytokines are induced concomitantly, especially during Gram-negative bacterial or viral infections. The major, new finding of the current study is that in mice, the induction of IFN-γ by IFN-αβ and IL-18, like in humans, proceeds via a STAT4-dependent signaling pathway and that the activation of STAT4 is directly linked to IFN-αβ. This was unexpected, because it is currently believed that IFN-αβ activates human, but not murine, STAT4 (6). In our study, murine IFN-αβ induced STAT4 tyrosine phosphorylation and IFN-γ formation in cultures of murine splenocytes, while human IFN-α alone, or in combination with IL-18, was inactive. In view of the current findings, we also propose that the minisatellite insertion identified in the murine Stat2 gene (24), which was made responsible for the loss of IFN-αβ-induced STAT4 activation, has no influence on the capacity of STAT2 to activate STAT4 in mice. Alternatively, there must exist other site(s) for recruitment of STAT4 to the murine IFN-αβ receptor. The finding that IFN-αβ does activate STAT4 in mice as it does in humans invalidates current consensus. Activated STAT4 binds to the IFN-γ promoter and increases gene transcription (30, 31). It also participates in the induction of the IL-18R and adapter protein MyD88, which are involved in IL-18 signaling. These STAT4-mediated effects are essential for the synergism of IL-12 with IL-18 in the induction of IFN-γ (28). It is reasonable to assume that the same effects are also essential in the IFN-αβ (IL-18)-dependent induction. The two defined pathways of microbial IFN-γ induction exhibit several common features. The protagonists in the two pathways, IL-12, IFN-αβ, and IL-18, are induced following the interaction between evolutionarily highly conserved constituents of pathogens and pattern recognition receptors on cells of the innate immune system (32, 33). The pathways are operational in different cell types, including NK cells, T cells, and macrophages. NK and T cells are responsible for the IFN-αβ (IL-18)-dependent IFN-γ production in primary murine splenocytes (M. A. Freudenberg and C. Galanos, unpublished data). Finally, IL-18 and STAT4 are involved in both pathways. In conclusion, in mice, STAT4 occupies a key position in the pathways controlling the recognition of pathogens and the resulting inflammatory reactions, as it does in humans. Therefore, in this respect, the mechanisms linking innate and adaptive immune responses are conserved in both species, and the use of mouse models for the study of human diseases caused by infection continues to be justified. We thank T. Boehm, R. Silverstein, and P. Nielsen for reading the manuscript and J. Kühnle, N. Goos, and H. Kochanowski for excellent technical assistance. ↵1 This work was supported in part by Bundesministerium für Bildung, Wissenschaft, Forschung und Technologie-Gesundheit, Projekt O1KI9854/8 and by Deutsche Forschungsgemeinschaft, SP “Angeborene Immunität” (FR 448/4-1). ↵3 Current address: GeneScan Europe, Freiburg, Germany. ↵4 Abbreviations used in this paper: tlr4, Toll-like receptor 4; mr, murine recombinant; hr, human recombinant; IL-18BP, IL-18 binding protein; wt, wild type. Vogel, S. N.. 1992. Lipopolysaccharide-induced interferon. J. L. Ryan, and D. C. Morrison, eds. In Bacterial Endotoxic Lipopolysaccharides Vol. II: 166 CRC Press, Boca Raton.